How many of us love buying new cosmetics every month? I remember, when I was in college, I would save up pocket money just so that I could buy a raspberry flavored lip balm or that lovely new pink nail polish & what not. But then, little became lots & then I suddenly realized that there wasn’t going to be space for anything new! 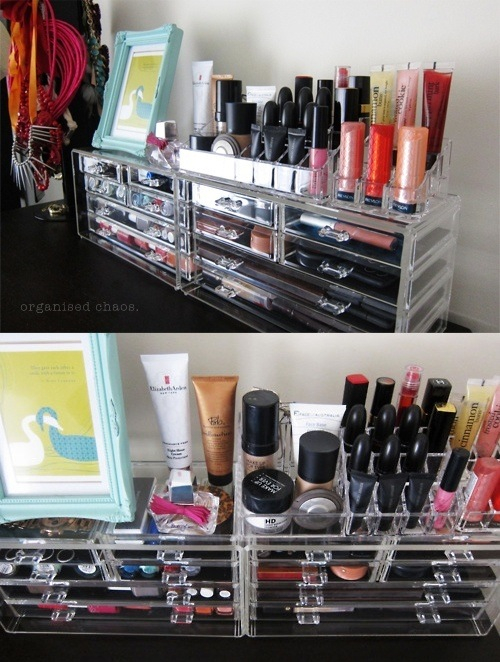 But that cannot happen, we somehow manage to make space but the purchases & wish-lists do not stop 🙂 This post is for all those makeup lovers who are looking for ways & means of storing their stash. Very recently, Colorbar launched some very funky & colorful makeup pouches. They come in different shapes & sizes & are mostly in soft fabric hence making the products move around all over the place. Also since it’s not a hard case, if by chance you put something over the pouch, you are in constant fear that a product is going to get crushed & break! But then, they are extremely pocket friendly & in case if you want to carry say 10 products, this pouch can handle it! MAC bags are lovely & they last for years together! 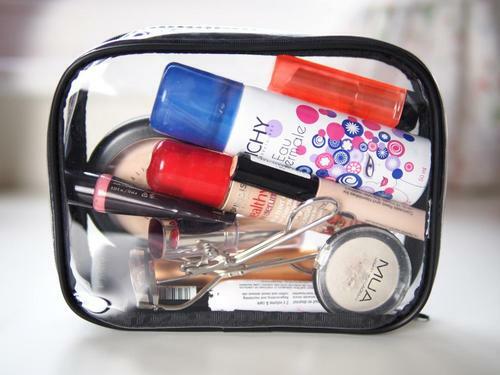 They have their Softsac in small, medium & large sizes & are perfect for storing any kind of cosmetic product. They are good to travel or even slip inside a dressing table drawer. They also have Rectangle bags in small & medium, with the MAC logo scattered all over the bag. If you are the kind who likes to show off the brand, this one is for you! Also, sometimes MAC launches limited edition collections in which you may find some cute & funky colorful pouches. In case if you’d want to be notified about them, make sure to drop by their makeup counters regularly or leave your name & number so that they can call you back when a new collection is launched. Oh and the pouches are pretty steeply priced – they start at Rs. 1500/- & go higher! So splurge only if you totally ‘love’ it! This website has the most amazing makeup organization boxes. They have separate compartments for different things, they come in various sizes, they even have a separate box only for nail polishes! 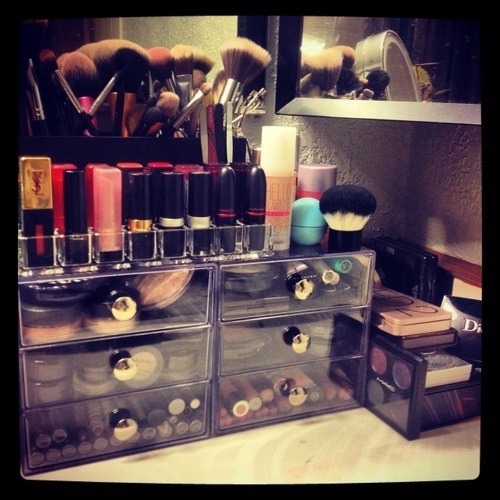 For me, this is a one-stop-shop for all my cosmetic storage needs! This site is as good as themakeupboxshop.com the only difference being this one has more pouches & bags too to choose from. These are perfect for travelling & are mostly transparent hence making products easily visible The other good thing is that all their products are super reasonable & at the end of it you become so greedy that you just cannot stop with one! There is the ‘counter top’ section which is again filled with big plastic boxes that can be placed on display on a table. 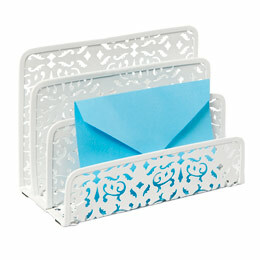 A clever way of storing your palettes is with a letter sorter. 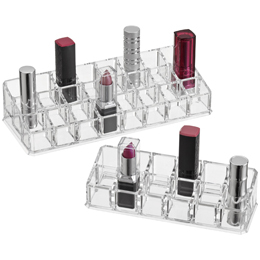 It typically holds 3-4 palettes per compartment and keeps them readily available. If you’re like me, having a ton of palettes with every color under the rainbow is completely necessary. With this storage solution you will definitely get a lot more use out of each palette and make your beauty collection a little less cluttered. 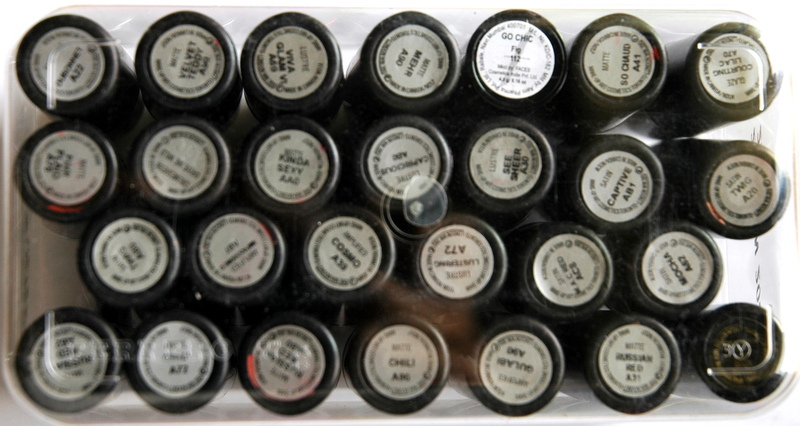 If you have a whole makeup bag dedicated to lipstick, you’re not alone. 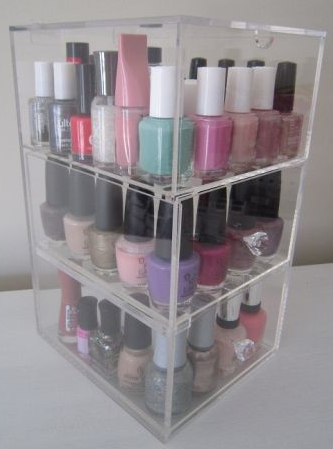 Instead of storing all of your shades in a bag, go for acrylic lipstick risers in clear. You can see your selection of colors when doing your makeup and it makes your lipstick perfectly accessible on your vanity. Makeup forever is a professional brand hence you’d find more professional pouches mainly catering to makeup artists. But their Crystal Studio pouch in different sizes & Crystal Vanity pouch are great for carrying skin care & makeup all together! Their pencil pouch is similar to the pencil boxes we used to carry in school 🙂 Great for carrying eye pencils, lip pencils, eye liner & makeup brushes! In case if you own way too many products & would like to hang them all in the bathroom, have a look at the Unfolding pouch – this one can hold up to 15 products & is perfect for travel purposes as it folds & becomes a small cute bag! 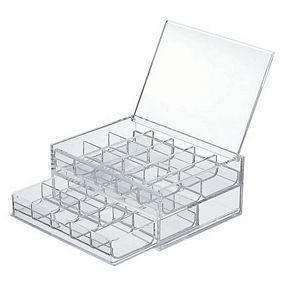 This site too has a number of Acrylic boxes & containers which are decently priced. 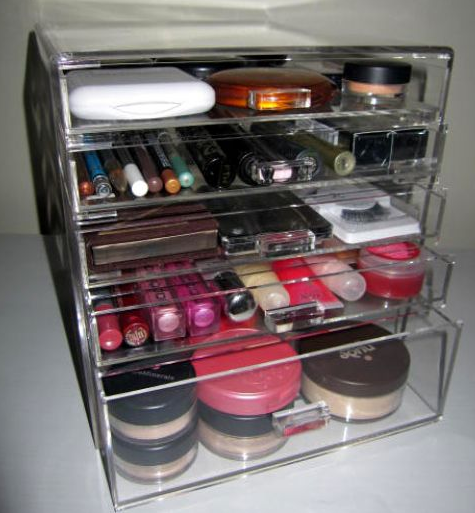 The best products for storing makeup I feel are the Acrylic Jewellery Case 2 Drawers – which you can use to stack up lipsticks, Acrylic 5 drawer box – to store all makeup products in case you have many & Acrylic Box – 2 Drawers Narrow – for people who have lesser makeup & skincare. Try storing your lipsticks in a Ferrero Rocher chocolate box 🙂 It’s transparent sturdy & you can easily spot the lipstick shade from the bottom. 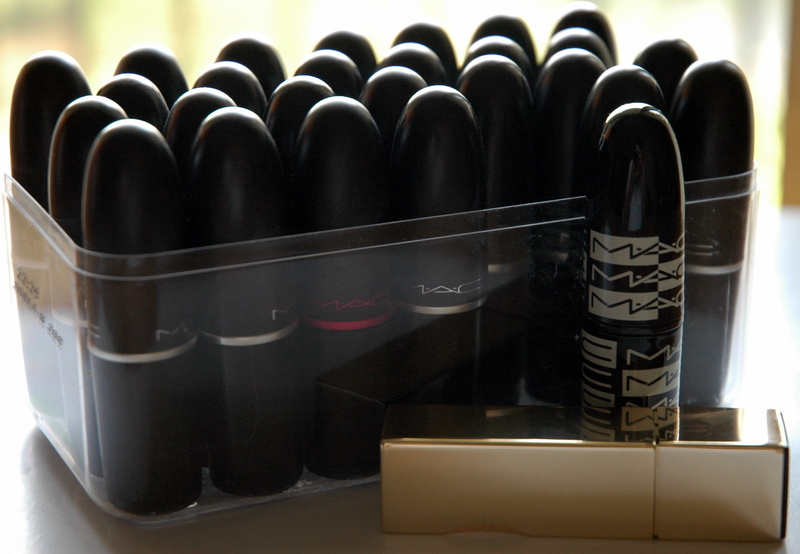 This is how I store my lipsticks. 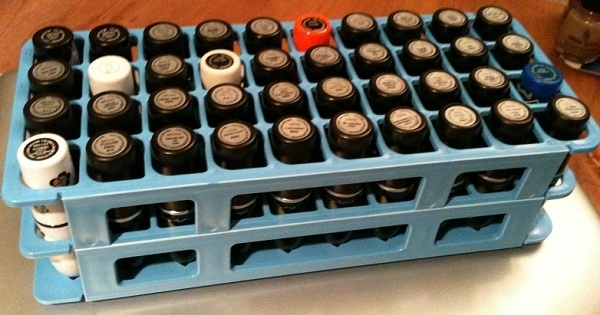 Or how about storing them in a test tube holder! In case if you like to keep all your makeup in the open so that it’s easily accessible, try finding a cupcake stand. 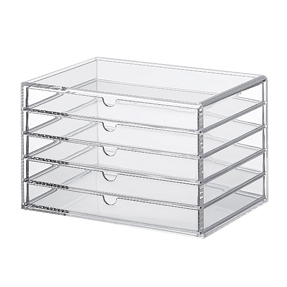 Use it to stack up polishes, lipsticks, eye shadows or just anything makeup related! 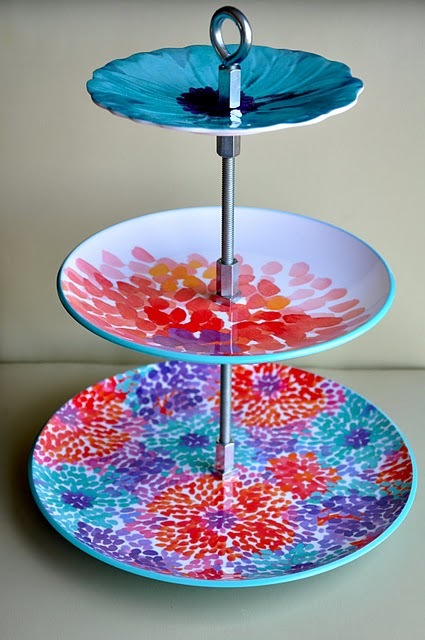 Want to make a brush holder? 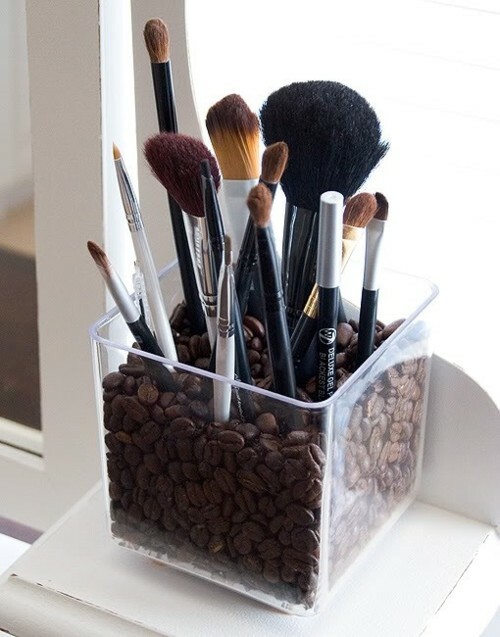 Fill a glass or acrylic square or circle container with coffee beans. Place your favorite brushes in them along with your regular kajal pencils. Love glitter? 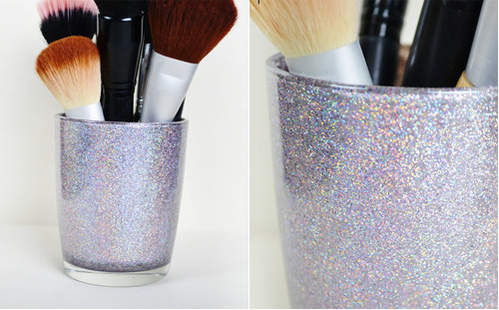 Take a glass (like an empty Nutella jar), paint it entirely on the outside with some glitter nail polish of your choice. Voila! You have your own sparkling brush stand! ← Want to make big eyes look smaller?